"THE PRICE IS RIGHT," network television’s #1-rated daytime programand the longest-running game show in television history, which airs weekdays on CBS, will be highlighted at this year’s 2017 Los Angeles Comic Con. The official Big Wheel will be displayed in the South Hall of the Los Angeles Convention Center beginning Oct. 27 - Oct. 29. Do not miss guest appearances by the show’s stars host Drew Carey, announcer George Grey and models Rachel Reynolds , Manuela Arbelaez, Amber Lancaster and James O’Halloran throughout the weekend. 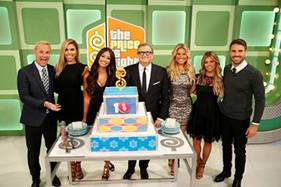 On Oct. 28 at 1:00 p.m. PT, comedian, actor and host of "THE PRICE IS RIGHT" Drew Carey will receive L.A. Comic Con’s Comedy Legend Award. Join as Drew talks about his monumental 25-year career, in which he’s conquered sitcoms, game shows, stand up and improv; the impact he has had on the comedy and television world; and what's next for this versatile and beloved performer. Carey joins previous Comedy Legends Award winners Louie Anderson and Howie Mandel as a member of the next generation of legendary comedians who have re-shaped the comedy landscape, while also still performing at the top of their game. Also, on Oct. 29 at 12:30 p.m. PT, "THE PRICE IS RIGHT" announcer George Gray will act as a guest judge in the 4th Annual Kid’s Costume Contest located at the Hot Topic Main Stage. Come and cheer on the cutest and bravest L.A. kids as they “Come on Down” to show their stuff and compete for great prizes.